You may have come up against this error “Interactive logon process initialization has failed” while installing Windows Server 2008 x64 as a Hyper-V virtual machine. This article describes what causes this error and how to get around it. 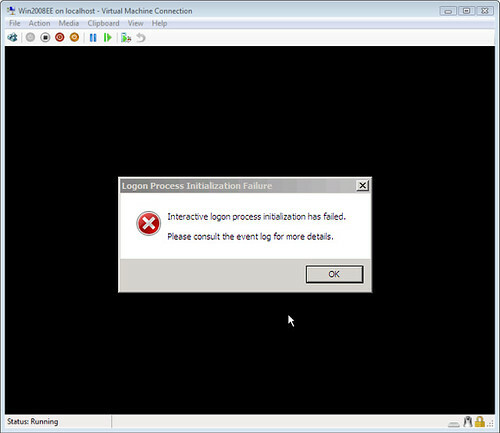 You may have come up against this error "Interactive logon process initialization has failed" while installing Windows Server 2008 x64 as a Hyper-V virtual machine. This article describes what causes this error and how to get around it. With my laptop running Windows Server 2008 x64, I was quick to try my luck at enabling the Hyper-V role and play with all the new shiny things. 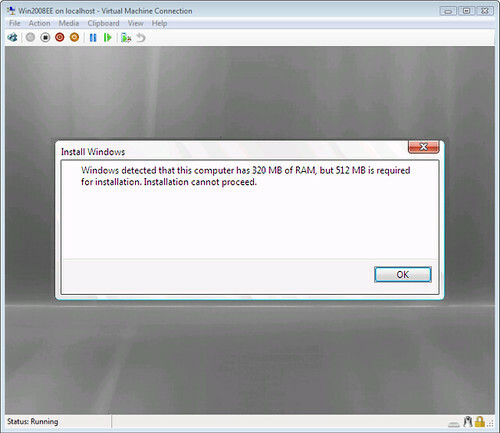 Initially I imported a number of existing virtual machines from a Virtual PC 2007 installation, everything ran perfectly. I’d even built a fresh installation of Windows Server 2003 R2 just to see the speed improvements over Virtual PC - indeed there was some improvement. At this point I was ready to try my luck and build my first Windows Server 2008 x64 Virtual Machine. I configured everything as desired, connected my Windows Server 2008 x64 ISO image to the synthetic DVD drive and started the virtual machine. Hmm, that’s strange, I’ve built a number of commercial Windows Server 2008 x64 images in the past however this was the first time on my laptop. Could this have something to do with the limitations of my physical hardware? I restarted the VM and tried once more. The error persisted and I started to think that perhaps it was the dual processor support I’d enabled. Disabling dual processor support didn’t fix the problem. I needed to think some more. Windows Server 2008 as well as Vista use WinPE for the initial deployment and setup of Windows. That had me thinking that perhaps it was a memory issue. If I remember correctly, WinPE required 170MB of RAM in order to boot, but this is the new WinPE 2.0, based on the Vista kernel and might need a bit more. Windows Server 2003 was happy with 128MB and this size was perfect for my laptop based test lab. I bumped up the memory from 256 to 320. Presto! It worked, well, at least moved to the next stage of the installation. So it was memory related; my hunch was right. I clicked through to the next stage only to be greeted by the following message: "Windows detected that this computer has 320 MB of RAM, but 512 MB is required for installation. Installation cannot proceed." That’s going to put a serious dent in the size of my test lab, considering that I’ve only 4GB to play with. Of course, I did roll my eyes as this wasn’t my most shining moment. Had I remembered the minimum system memory requirement for Windows Server 2008 is 512 MB, I could have saved myself an hour or two. But as we all know, pushing the boundaries in a test lab is an everyday thing; we’re either constrained by hardware or cash - usually both. My only consolation in this exercise is that perhaps someone else might benefit from my moment of folly.